Today the House Ways and Means Committee is scheduled to markup bonus depreciation, a.k.a. bonus expensing, which would allow all businesses to immediately deduct 50 percent of investment in equipment and software with the remainder to be written-off over a few years according to the normal depreciation system. One concern is the budgetary costs, which the Joint Committee on Taxation (JCT) has estimated at $263 billion over 10 years. Is this a believable number? No. JCT is using static analysis, which explicitly assumes tax changes have no impact on economic growth. Economists know that is not the case for many tax changes, particularly those that lower the cost of investment, such as bonus depreciation. We find bonus depreciation would boost investment and other economic activity to such a degree that it would pay for itself in the end, and eventually increase revenue by $23 billion per year. JCT has dynamic macroeconomic models, and they should use them to analyze such important pro-growth changes to the tax code. The static analysis is simply not appropriate for any tax change that might plausibly affect economic growth. Another concern is that the House proposal would make bonus depreciation a permanent part of the tax code, when it has historically only been passed on a temporary basis. However, bonus depreciation is but one of many ways Congress has historically voted to accelerate depreciation. The last major permanent change to the depreciation system that significantly accelerated investment write-offs was in 1981, the first round of the Reagan tax cuts. Besides dramatically lowering tax rates, Reagan’s first tax cut also dramatically sped up depreciation, e.g. it cut the write-off period of structures to 15 years from the old range of 16 to 45 years. Some of these tax cuts were reversed in subsequent years, and other taxes increased, but the depreciation system from 1981 on remained relatively more accelerated than the depreciation system that existed pre-1981. Did the 1981 tax cuts pay for themselves? Some of them did, including the depreciation changes, according to simulations of the major provisions. Some of the tax cuts did not pay for themselves, but on balance the 1981 tax cuts were extremely pro-growth, and the ensuing economic boom lifted tax revenue as well. 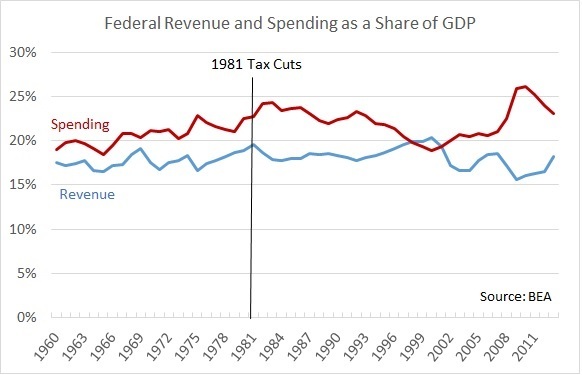 In fact, the five years following the 1981 tax cuts saw the highest average federal tax revenue as a share of GDP of any 5 year period prior to 1981. The Fed-induced recession caused revenue to drop somewhat after 1981, but never to the lows of the 1970s or the 1960s. It is true that the Reagan years saw increased deficits, but that was due to increased spending. Average spending in the 5 years from 1981 to 1985 was higher than any 5 year period prior to 1981 (except WWII), and the increase in spending was even larger than the increase in tax revenue. The chart below shows the BEA data. In sum, the Reagan era points to the benefits of accelerated depreciation, not only in terms of economic growth but also in terms of higher, more sustainable tax revenue. For a more detailed review of the Reagan tax cuts, see the analysis by Steve Entin.